Saraswati Devi is a goddess of water and wisdom, worshipped across Asia by millions of people in multiple faiths. While she is the patroness of learning and the arts, she is also ancient and elemental in her power, for she was once a guardian spirit of the sacred river from which she took her name. 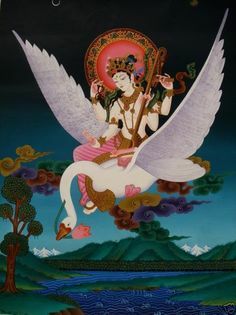 The Saraswati River was said to have its source in the heavens, though her essence no longer flows to earth in the form of the waters, but instead as the fluidity of inspiration itself. Those lucky enough to drink from her wellspring have wisdom that can break the backs of mountains, just as in the age of the Vedas. I was born with the moon at zero degrees in Cancer, and I celebrate my lunar return every month during the transit from Gemini. It’s a pleasant time for me, as my intuition is heightened and I can feel My Lady’s presence that much better. Though Lady Saraswati is not a “moon goddess”, her iconography is rich with lunar imagery. She wears a crescent moon as her crown, and her praise invariably includes references to the beauty and splendor of the full moon. Incorporating lunar observances into my practice helps me connect with that aspect of her.